Satisfy your Cantonese culinary cravings with an enticing prix-fixe meal available at Hakkasan Las Vegas Restaurantinside MGM Grand Hotel & Casino. 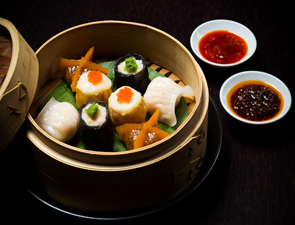 Celebrated for its modern Cantonese cuisine, the restaurant will offer its new Taste of Hakkasan menu featuring some of Hakkasan’s most eclectic selections, created by Michelin-starred Chef Ho Chee Boon and his team of highly skilled chefs. Designed to present diners with an innovative way to experience Hakkasan, guests can enjoy the restaurant’s most sought-after dishes in a special three-course menu. Priced at $48 per person from 5 p.m. to 7 p.m., the menu will guide diners on a culinary journey making the evening a truly valuable affair. Highlights include the Hakka steamed dim sum platter; Stir-fry mushroom lettuce wrap; Crispy silver cod with mamit sauce; Spicy prawn with lily bulb and almond along with many more selections. Guests may finish their meal with the Yuzu and mango mousse, comprised of yuzu genoise, mandarin gelée and lychee sorbet. The restaurant’s a la carte menu also will be available. For more information on how to experience a Taste of Hakkasan at Hakkasan Las Vegas Restaurant, visit www.hakkasan.com/lasvegas or call 702.891.7888. Dylan Prime returned to TriBeCa, blending its classic approach with a new market-fresh focus on game and seafood. Debuting a reclaimed industrial design, the space now offers three private dining rooms, a Chefs Table, a raw bar and a stand out cocktail program. 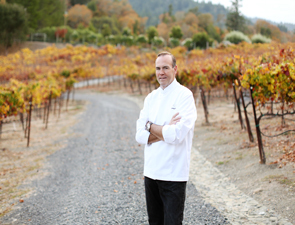 Owner John Mautone remains at the helm of the beloved dining destination, having tapped longtime friend and culinary expert Chef Kerry Heffernan (Eleven Madison Park, Montrachet, Le Regence, Restaurant Bouley) to consult on the menu, evolving the venue into its next ‘prime’. 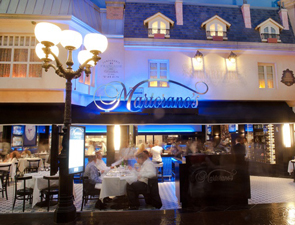 Executive Chef Michael Berardino oversees daily kitchen operations, working with Consulting Chef Heffernan to execute a modern American menu focusing on seasonal meat and fresh catch, all enhanced with market ingredients. 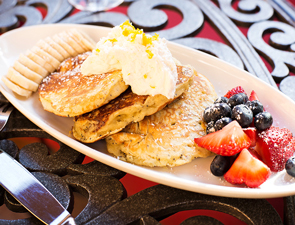 Open for lunch and dinner daily, guests can enjoy eating in both the lounge and main dining room. In the lounge, selections include: housemade charcuterie, small plates including surf and turf with bone marrow and fired oysters; a brisket burger with Fontina and bacon jam, and lobster pot pie with fennel, Yukon gold potato, lobster cream and sherry. In the dining room, select options from the lounge are available, but a seasonally driven, farm/catch to table menu is truly the draw. Long time favorites like the filets, New York strips (bone in and out), ribeye and porterhouse options remain. They are now accompanied by Chef Heffernan’s artic char with Jerusalem artichokes, and Chef Berardino’s monkfish and tea brined duck breast. The new Dylan Prime aesthetic is the vision of interior designer Chris Smith of CMS Architecture and Design. Having designed past incarnations of the space, Smith now pulls historic references from the TriBeCa neighborhood as well as the building itself, which was a main manufacturing facility for R.E. Dietz Co. lanterns for 70 years, until they moved production overseas. Original scalloped ceilings typical of the neighborhood remain throughout much of the space, with most of the wood accenting throughout reclaimed from neighboring buildings. In the 2,000-square foot lounge, midnight oil colored walls complement lacquered natural wood accents, while the underbar is clad with iron shutters also from the neighborhood. The reclaimed 150 year old wood bar top offers seating for about 20, intersecting with a classic, semi-circular marble raw bar. Industrial-inspired lighting shines in the space, including a wall of authentic Dietz lanterns, another homage to the building’s origins. The revitalized beverage program takes a fun approach to classic cocktails with a barrel aged Manhattan on draught, an exceptionally expansive collection of large format wines, craft beers and a “build your own” martini menu with assorted stuffed olives such as lobster, oyster, kimchee and Hudson red cheese. Once in the 30-table dining room, Smith has created a clean muslin palate, again accented by custom burnt wood trim. A centerpiece of the design is the 500 label wine room, framed by industrial glass windows and set in 8 ft. by 13 ft. rustic apothecary-inspired reclaimed shelf. 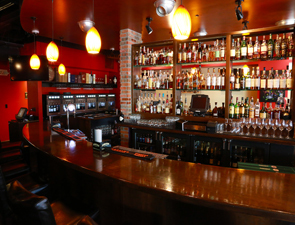 The space’s original bar remains for those wanting to enjoy the seasonally driven menu or a drink removed from the lounge, as well. Chefs Table: Set just beyond the main entrance, between the lounge and main dining room, is an impressive arched copper-ceilinged boutique private dining enclave set to house an exclusive Chefs Table. This room features large windows peeking into the kitchen and seating for up to 14 at a custom-built table set beneath a wrought iron orb chandelier. Dietz Room: A 400 square-foot space, the Dietz Room is the largest private room in the new Dylan Prime, set just off the main dining room in what was originally used as the carriage arrival/delivery area when the building housed R.E Dietz, Co.. Modernized, it can host up to 35 people seated or more for a cocktail style event and is equipped with a 65-inch television hidden behind a two-way mirror. Oversized windows overlooking the dining room create necessary privacy while presenting the opportunity to remain connected to Dylan Prime’s energy. The Vault: Situated at the back of the dining room, this room derives its name from the building’s original safe that still remains, now acting as a design feature displaying vintage-inspired cocktail and bar trappings. 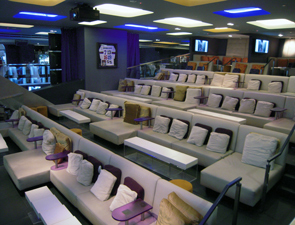 The Vault offers seating for up to 30 people. Longtime owner John Mautone remains as Dylan Prime’s leader, having teamed with New York City’s hospitality industry expert Jonathan Eisenberg of Spark Hospitality Group. General Manager Rob Burns continues to oversee daily operations and lead the beverage program, surrounded by a new hand picked team and talented staff. 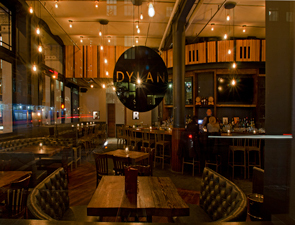 Dylan Prime is located in TriBeCa at 62 Laight Street at Greenwich Street and is open for lunch and dinner daily in December. Reservations can be made by calling 212-334-4783 or visiting dylanprime.com. Keep up to date via social media: facebook.com/dylanprime; twitter.com/DylanPrime. 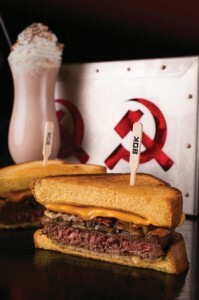 KGB: Kerry’s Gourmet Burgers at Harrah’s Las Vegas continues its year-long burger and shake series with this month’s delicious creations, the BBQ Grilled Cheese Patty Melt Burger and Heath Bar Crunch Milkshake. The BBQ Grilled Cheese Patty Melt Burger is made with an Angus beef patty, sandwiched between two pieces of thick Texas toast, Gouda cheese, cheddar cheese, apple-wood smoked bacon, caramelized onions and mushrooms. The Heath Bar Crunch Milkshake is a toffee and chocolate creation made from homemade Heath Bar ice cream, whipped cream and pieces of the popular candy bar. Burgers are served with fries and are priced at $14, shakes are $6, and the burger and shake of the month combo is $18. Ordering in pizzas for a party probably isn’t going to impress, even if the pizzas are quality fare. One critically acclaimed gourmet spot in Las Vegas has the answer - taking a custom Napolitano wood-fired brick oven on the road. They will set up shop in the backyard and turn out favorites for guests such as the Tartufo with black truffle, parimgiano riggiano crema, fontina fontal, roasted cremini and an over easy baked egg. 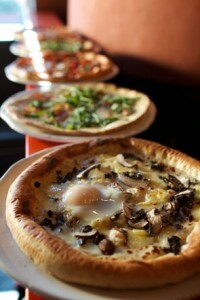 Using imported Italian ingredients they can serve up three hot and fresh Neapolitan pies every 90 seconds. Cost is $500 for the oven and chef plus a per pizza charge, at the same cost as in restaurant menu pricing. 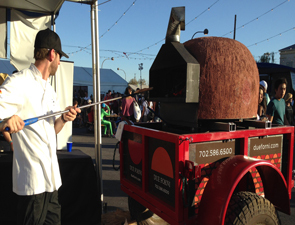 Due Forni’s mobile pizza oven is currently available in Las Vegas, but the pizzas can also be enjoyed in their just opened Austin, TX restaurant or the original Vegas location.